Just a few short weeks ago, right around the time we moved into this house, I was sorting laundry, piles and piles (more like miles and miles) of it. Matty walked into my bathroom and said, “Mommy, I’ll help. This can be one of my chores!” Hallelujah, an assistant! I was so grateful for this little laundry helper that I grabbed him, gave him a big hug and lots of mushy kisses. After our little love fest, we continued sorting. And sorting. And sorting (WHY did we have so much dirty laundry? I washed almost everything right before our move!). We finally got to the bottom of the basket and had about seven loads. But the work was far from over. Those seven loads have to be washed, dried and folded. Ayayay! Every laundry day (or days) after that, my little assistant and I go through the same routine…until this week! 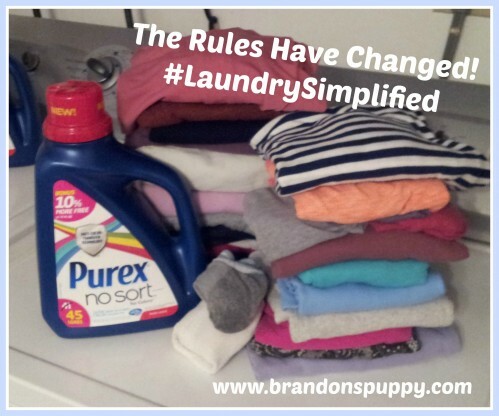 I received an email from the folks at #CollectiveBias telling me that the “Rules Have Changed” thanks to Purex®. They wanted to know if I wanted to try the new Purex® No Sort™ for Colors detergent. Of course I did! I love spending time with my little guy, but I’d rather be having fun than doing chores, and it sounded like Purex® No Sort™ would cut my laundry time in half. We could stop sorting and start playing! Now we had to go purchase the detergent. We hopped in the car and headed for Walmart. There it was, right there with all the other Purex® products. That was easy! We were now ready to go home and do some laundry. I’m happy to report that after using Purex® No Sort™ for Colors, we’ve reduced our typical seven or eight piles of laundry to four. Success! Because of its Anti Color Transfer Technology, the reds, blues, purples, beiges, blacks and whites stayed exactly as they should. We’re saving time, and money: we’re washing less loads, so that’s less times we run the washer and dryer. 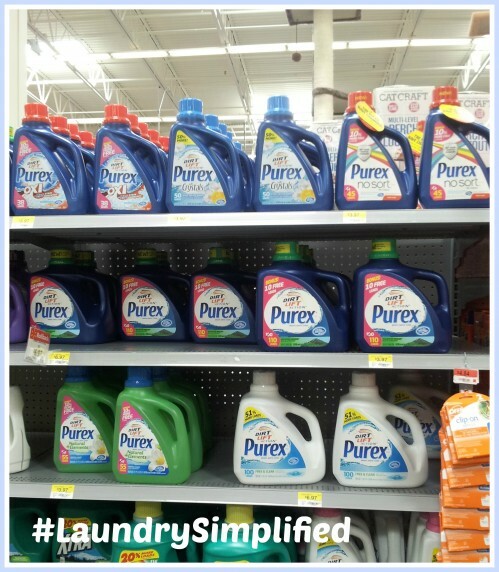 Purex® No Sort™ for Colors make #laundrysimplified! Laundry users believe sorting is an essential part of their laundry routine so our challenge is to convince them that has changed. In order to reassure our consumers we have focused on educating them on our breakthrough Anti-Color-Transfer Technology which traps loose dyes in the wash and does not let them settle onto other fabrics. As a result they are able to simplify their laundry routine by doing less sorting and less loads. There’s one small disclaimer to using this new detergent. 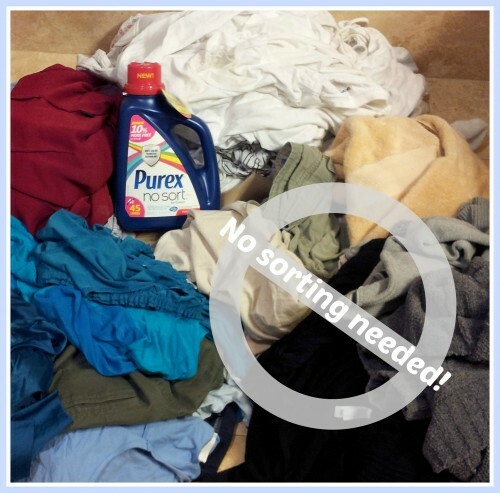 The label on the back of the bottle says: Purex® No Sort™ detergent is packed with innovation, but it can’t perform miracles, so please follow these words of advice: wash strongly colored fabrics or new pieces of clothing, especially jeans, separately at least 5 times before doing a mixed color load with Purex® No Sort™ detergent. This entry was posted in Deals and Discounts, Social Media. Bookmark the permalink. Thanks BB! He’s a cutie, but a handful!